[Pre-script : I have written this post inspired from Swami Paramasukhanandaji’s (one of my teachers) lectures on Ramayana. Ramayana references are from Srimad Valmiki Ramayana with Govindaraja’s commentary, which can be found online. English translations of all verses are either from online sources and/or modified according to my understanding. Errors anywhere are mine and will be gladly corrected if pointed out – Prasad]. [Whether kingdom or forest-dwelling, both are the same to me. Among these too, forest-life is a great boon (for it is conducive to my mind which seeks tapas)]. What makes Rama say so? What is going on behind the scenes in Rama’s mind that gives him the strength to hold such positions? We come across an occasion in the Ramayana (Ayodhya Kaanda – Chapter 105) where Rama reveals his understanding leading to such a dispassionate and Dharmic mindset. Lord Rama, following the dharma of pitru-vaakya-paripaalana (living in line with the ideas of a dhaarmic parent), has made his way into the forest and settled in Chitrakuta. Bharata, who was not present when Rama left Ayodhya, comes to meet Rama at the forest with much grief, to convey the demise of their father Dasharatha, and to convince Rama to return to Ayodhya and take up the responsibility of the kingdom. Seeing Bharata’s predicament and with the view of removing his grief of having lost their father, Rama speaks to Bharata. Rama explains the uncontrollable aspects of human life and also of the fickleness of wealth, relationships, power, and even life. Because of the fact that all these pass away, they are not worthy of being attached to. One does not really possess them at any time, so it would be unwise to mourn their loss. Dharma alone is worth being lived for, and one should always exercise viveka (discrimination) and vairaagya (dispassion) when it comes to all attachments, including people, objects, positions, and circumstances. This means a deep reconciliation with the fact that none of them are permanent, and therefore none of them are worthy of prioritising over Dharma. For the sake of Dharma, all worldly things are ought to be given up. Only such a mind is most favourable for entering into Vedanta, which begins with placing Ishwara and Dharma above desire for family and possessions. [No creature is endowed with the power of exercising any control over the course of events, man has no independent status in nature. The destroyer draws him both here and hereafter]. kālo’smi lokakṣayakṛtpravṛddhaḥ – Gita 11.32. [Time is I, the great dissolver of the manifested universe]. Rama points out that no individual is in complete control of his life, there are always hidden factors which are out of one’s control. Different people call this by different names, luck, chance, fate, etc. Here Rama calls it “Ishwarah” and “Krtaantah”. This is Kaalah, the Lord appearing as time. [Those that increase, are destined to deteriorate; those that go upward ultimately fall, those that come together separate in the end, and life at length meets with death]. [In this world, days and nights pass away with creatures, and speedily impair their lives even as in the summer the rays (of the sun) (dry up) the waters]. [Do thou therefore deplore thyself. Why dost thou lament anything else? Everyone’s life is decreasing, whether he sits or moves]. Rama points out the fact that all things in the life go through ups and downs. This is an obvious fact, but it is missed by most in general. The test of the recognition of this fact at all times is the lack of sorrow when things which we value go away, either suddenly or gradually. Here, Bharata feels grief at the loss of father Dasharatha and at Rama’s banishment to the forest, which according to Bharata is a conspiracy in which his mother Kaikeyi played a major role. According to Rama, however, both events were merely the play of time. No individual is responsible for what happened, Kaalah merely rolls out the scenarios in one’s life according to one’s own Karma. In this way, Rama has reconciled with the events that have transpired, and finds no reason to grieve. Bhagavan Rama points out that neither power, nor status, by themselves are sources of security or stability in certain terms. Ishwara in the form of Kaala can change things upside down in no time. Death and destruction is certain to all things which are formed, and so it is natural to expect their occurrence at any moment. [People rejoice on the rising of the sun, they feel delighted at the approach of the night – but they do not understand that their lives have meanwhile been shortened]. [People are exhilarated at the commencement of a new season in novel fashion ; creatures get their lives shortened at the changing of seasons]. With the view of convincing Bharata of not being overcome with grief, Lord Rama now points to the unconscious hypocrisy that people have. On the one hand, people are excited with new and more exciting experiences everyday, but on the other hand, they fail to notice that they are getting closer and closer to their finish line. Rama dwells on the subject of death and old-age repeatedly so as to generate vairaagya in our minds towards all worldly possessions and relationships. This theme is repeated over and over in the scriptures, to the extent that it generates the feeling that Hinduism encourages suppression of emotions and feelings. It is therefore not for suppression but for mastery over emotions that the scriptures repeatedly point out the defects in being attached to the world. Emotions by themselves are not dangerous, the world by itself is not dangerous. But they threaten the individual’s development only when the individual has not enough viveka shakti (discrimination between dharma/adharma, and between the permanent Lord and the impermanent world) , not enough vairaagya (ability to prioritise dharma over adharma, and the Lord over the world). To get this viveka and vairaagya, it becomes essential to repeatedly engage the mind in thoughts which run counter to the usual monopoly of the chasing the fulfilment of desires and the overcrowding of the mind by emotional attachment to the world. This technique of engaging in counter-thoughts for extricating the buddhi from emotions is known as pratipaksha bhaavana. Pratipaksha bhaavana is not necessarily used only for self-control (holding back). It can also be used for self-engagement. For example, if there is a saadhaka (spiritual aspirant) who has an aversion to someone, to that saadhaka the Shaashtra tries to point out all the good things about the other person, and tries to prod him to engage with that person in a way so as to neutralise the aversion. Thus, the goal is to a have a mind that is sufficiently calm that it is not carried away by emotions. For such a mind, Dharma is essential, and for sticking to Dharma, one must have sufficient viveka and vairaagya shakti. This is the message that Rama seeks to convey to us. [As the mighty ocean, one piece of wood comes in contact with another; so, a person, having been in association another, is separated from him in time]. [In this way, wives, sons, kindred and wealth, having been in association, go away; their separation is certain]. The physical body is nothing more than an inert matter floating in the ocean of Samsaara. It is the individual’s prior karma that is responsible for the variety of experiences in life, and so this karma alone is also responsible for the ushering in and out of relationships in the world. When a child is born, the parent may think, “By me, for my sake, my child is born”. However, the child is born with its own baggage, its own karma. The individual karmas of both the parents and the child bring together this relationship, and all those experiences that entail it. Once the karma that brings together the members of a relationship runs out, the relationship will come to an end. Like wood pieces floating in an large ocean, being moved by the waves of karma, individuals come together in relationships and eventually separate also. With Kaala comes the effects of one’s past karmas, and with Kaala they go away. Thus it is purely one’s own responsibility, one’s own karma, which is responsible for what one faces in life. Similarly, it is one’s own present karma which shall play a role in deciding the future. The individual is quite helplessly thrown around by the effects of his karma. By recognising this fact, by exercising one’s viveka shakti, one can come to terms with any situation and perform one’s Dharma as the situation calls for. This is what Rama tries to convey. As with all teachings, this teaching of karma in Hinduism is also applicable to oneself, for claiming responsibility for one’s life. It would be immoral to say to another suffering individual, “You suffer because you deserve to”, nowhere in the scriptures do we find such a suggestion. For those so cold-hearted to speak so in any circumstance, it is needless to say that they shall find themselves to be the receivers of such a remark by someone else. This too follows from the law of karma. [There exists not one in this world that can change one’s nature as received. A person lamenting a dead individual, has no power to prevent his own death]. Lord Rama here points out that no matter how many deaths are seen by a person, the reality of one’s own death does not hit him. The knowledge that “I will too one day pass away” may very well be there, but it does not translate into wisdom, which is only characterised by the person attempting to use his lifetime to perform Dharma and attain Moksha (liberation from sorrow) and not prioritising sense-enjoyments over Dharma or the pursuit of Moksha. [In sense-enjoyments, there is fear of disease; in social position, the fear of falling of; in wealth, the fear of hostile kings; in honour, the fear of humiliation; in power, the fear of foes; in beauty, the fear of old-age; in scriptural erudition, the fear of opponents; in virtue, the fear of traducers; in attachment to the body, the fear of death; thus, in all worldly things that people desire are pervaded by fear; renunciation alone stands for fearlessness]. The enjoyment of sense-objects are always laced with a number of doshas or afflictions, which prevent any real lasting happiness from them. The very fact that there is the knowledge that they are shortlived is one such dosha. Besides, there is also the fact that there is a perpetual gradation in such enjoyments. No amount of such enjoyments are sufficient to completely satisfy anyone. Much like substance-addiction, they are also required in increasing amounts to satisfy the enjoyer. Then of course there is the idea of comparison in one’s mind, which makes one desire for more and more and also creates lack of joy in whatever one has. Thus, the contentment with what one has, is alone the cause for real joy, not perpetual desire or enjoyment. And such contentment is gained through this repeated `seeing of faults’, dosha darshanam, in the objects of enjoyment. . Therefore it is a must to cultivate such contentment and vairaagya. Even to enjoy the objects of the world vairaagya becomes essential, for without it all sense-enjoyments, being laced with the doshas, lead only to more sorrow . The fact that “all things shall pass at any time”, has to be kept in the back of one’s mind, irrespective of whether life is pleasurable or sorrowful, and it is by repeatedly remembering this thought that one maintains an even-keel and is able to stick to Dharma and the pursuit of Moksha. [Such manifold grief and mourning and lamentation should be renounced by intelligent and firm persons in all conditions of life]. A man of wisdom does not grieve, for all the above-mentioned reasons, Rama says. Furthermore, Dasharatha was a Dharmic king, and will have found his place in Svarga. Dasharatha’s passing is not worth grieving over or prioritising over Dharma, either by consideration of the nature of life or by considering that Dasharatha’s Dharmic actions, he would have found a comfortable place in heaven. [Do thou cast this grief, let not sorrow overpower thee. Going thither, stay in that city. And, O best of speakers ,this was also enjoined by our sire of controlled senses]. [I also must do my noble father’s will as to whatever that one of pious acts has laid upon me]. Having thus accepted that whatever has happened is the work of the Lord as Kaalah, and moreover there being no reason to consider what Dasharatha has said as adharma in any way, Bhagavaan Rama concludes that it is indeed Dharma for him to stay in the forest, while Bharata himself should take the responsibility of the kingdom in accordance with their father’s wishes. 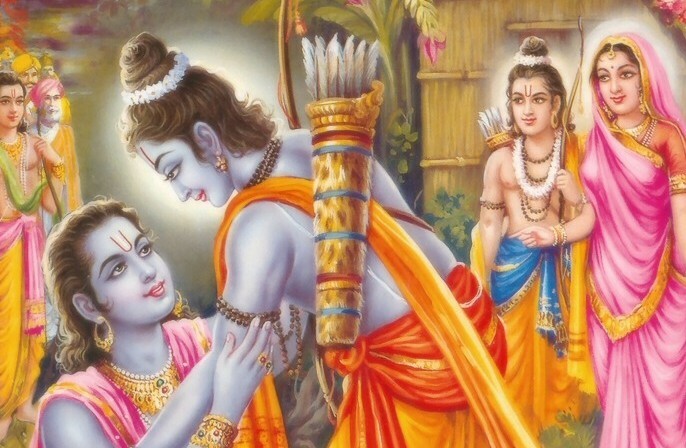 The Ayodhya Kaanda itself carries on very interestingly with this debate of whether Rama’s stay in the forest is Dharmic or not, but we stop here in keeping with the theme of this post. Why should we denounce worldly enjoyments? because they bring sorrow? so is the only aim of human life to avoid sorrow and misery? Is a life lived with only happiness and peace considered worthwhile? If fear of loosing our comforts and pleasure is a reason to stay desireless, shouldnt we rather stay unattached, i.e., ready to enjoy any pleasure but at the same time ready to relinquish any pleasure as and when time demands a change, isnt that sufficient for a life of happiness and peace, bereft of sorrows? is that Dharma? i didnt understand the meaning of Dharma; how is it impervious to the spears of time? how does it alone remain unchanged? What action is considered Dharma million years ago can be still Dharma today too? >>What is Dharma. i didnt understand the meaning of Dharma; how is it impervious to the spears of time? how does it alone remain unchanged? What action is considered Dharma million years ago can be still Dharma today too? Dharma as my teacher said is the performance of actions in such a way that your life as well as that of others is in general peaceful and comfortable in the long run. That Dharma is impervious to time can be understood in two ways, one being the traditional way where there are multiple janmas and there is law-of-karma, and therefore what brings one happiness in any janma is concerned to be Dharmic actions and what causes one suffering is adharmic actions. The other way is directly from the above defining for dharma, i.e., Dharma is alone worthy of being possessed because it alone brings lasting happiness. Any sense-pleasure or comfort should be given up for Dharma because compared to the results of Dharmic actions these sense-pleasures or comforts are temporary. In that way, Dharma is the only thing which stands the test of time. >> Why should we denounce worldly enjoyments? because they bring sorrow? so is the only aim of human life to avoid sorrow and misery? Is a life lived with only happiness and peace considered worthwhile? The idea is not to denounce worldly enjoyments per-se but to denounce them only when they threaten or disrupt Dharma (as defined above). When they disrupt Dharma, they (ultimately) do bring sorrow. The shaastra does not really point to some ‘new’ fundamental aim of life. It merely says, “This is what all people want, a life of happiness and security. Nobody wants unhappiness at any time.” This does not mean some constant state of sense-pleasure is desired by everyone. It only means that everybody wants a state where the mind is free to indulge in life enthusiastically, without fear from external authorities, without being plagued by guilt, etc. It is a fact that everyone considers such a life worthwhile. Now the question is what should you do to live such a life. For this certain ideas about oneself, about the world, etc are required. Everyone has some such ideas but the shaastra helps in understanding and framing a particular set of ideas in a very focussed manner so as to enable the abovedefined “happy-enthusiastic-life”. It keeps refining these collection of ideas until the individual understands that he/she is really free to have any emotions towards whatever is happening in life and the whole problem of unsatisfaction, not-having-enough, was created by thinking that “whatever i feel is what is real” and is not really a fact. To understand this, a dharmic lifestyle is very much required. A mind which prioritises enjoyments over Dharma can never be happy in the long-run, this is the declaration of the shaastra and is indeed a fact. This is similar to saying that ” A person who prioritises having fun on a bike, going fast, doing some tricks on road, etc. over driving according to the rules is going to have a nasty accident”, which everyone understands as a fact. Only now, the rules are spread over lifetimes and the actual pain may be felt much after the breaking of the rules. >> If fear of loosing our comforts and pleasure is a reason to stay desireless, shouldnt we rather stay unattached, i.e., ready to enjoy any pleasure but at the same time ready to relinquish any pleasure as and when time demands a change, isnt that sufficient for a life of happiness and peace, bereft of sorrows? Everyone who enjoys comforts, seeking security and happiness from them, is sure to have the fear, “What is going to happen to me when all these things which I hold dear are not there?”. Therefore there is a struggle from this deep-rooted fear to ensure that those things/people/etc. which I hold dear should always remain with me. This makes the entire life a struggle for being happy. The shaastra’s teaching is opposite. First separate your happiness from your life-experiences, and then act in the world as a duty for the good of others. The teaching of Dharma and then the teaching of Vedanta which follows is all for generating this emotional independence in the mind of the student. Now, it is easy to say “we should stay unattached”, but it is very difficult to do so in practice. It is quite easy for the mind to addicted to a particular kind of a lifestyle if one is engaged in it for long. For example, if I am told to stay away from any contact with home for more than a month, I will find it very difficult. My mind is going to throw up many thoughts about home, worry is sure to follow. Same thing holds good when there is going to be separation with anything that is held dear. For all normal people, the very act of constantly being in touch with objects of enjoyment (meaning anything which we derive happiness from) creates the opposite notion of being unhappy/worried etc in the absence of those objects. For this reason, shaastra necessarily recommends a slow-but-steady *physical* separation from the objects of enjoyment. This starts from living a Dharmic lifestyle where one has to give up enjoyments physically, for the sake of upholding Dharma, and it goes on to its summit in the case of Sanyasa, where all possessions (except bare minimum) and all relationships are given up. In fact, the sanyasi does a shraadha (final rites) for his own body before taking sanyasa. By this physical separation, one can really test whether one’s renunciation is really strong or just name sake. Only in the case of real, strong, renunciation, there is happiness. Otherwise unhappiness is sure to be there, proportional directly to the degree of attachment and inversely to the degree of renunciation. Forgot to answer this : What action is considered Dharma million years ago can be still Dharma today too? This is true in the case of saamanya dharmas (or universal values, if you wish), like satya (non-lying), ahimsa (non-injury), asteya (non-stealing), etc. This need not be true in the case of vishesha dharmas, or dharma which is specific to a certain mindset, a certain station in life, etc. For example as a student, a person’s dharma is to study and understand the subject well, but when the student phase is over, there will be other responsibilities which take priority. Ignoring them for the sake of learning will become adharma in that case.